I awoke dark and early to make the 75-minute drive to Tellico Plains. But apparently I didn’t get going early enough, as I arrived at the hamlet only 20 minutes before the start time. By the time I cleared the bathroom line and got ready to ride, the main group was already several minutes down the road. This wasn’t a problem, really, I just never caught up with most of the faster riders. 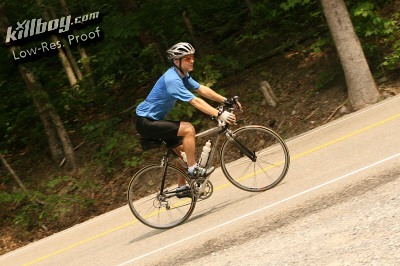 The rides’s first 20 miles was a very relaxing warm-up segment: cool temperatures, quiet country roads, very few hills. I even had a nice tail wind part of the way. I tried not to think about the miles ahead and focused on enjoying the first hour as just another early morning ride. Soon I passed a golf course, the first finger of the lake, and some residential developments. I had arrived at our first (and only) brush with civilization on the loop: Vonore, TN. I almost missed the first rest stop as I entered town–they moved it forward several miles this year to accommodate the event’s 50 mile option. I stopped for water and a porta-potty. At Vonore, the route follows 411 (a four lane highway) for three miles to cross the Tellico Lake. It’s not a bicycle-friendly road, but we had a couple policemen to help with traffic. The road also has wide shoulders (except for the bridge) to use if you don’t mind dodging debris. After this brief bout with civilization, the course veers off on a 17 mile stretch on 72/129 that parallels the lake system. There are a few notable rolling hills, particularly at the front end of this section, but by and large it’s flat–the last seven miles being right along the water. Although the winds were less favorable riding eastward, it was still smooth sailing, apart from the bumpy pavement. I averaged 19.2 MPH the first 40 miles. At about mile 42, Highway 129 dramatically turns into the woods and enters the renowned Tail of the Dragon (“318 curves in 11 miles”). Here lies the course’s first lengthy climb. But it’s not real steep–a fairly consistent 4%(?). I settled into a steady rhythm at 10-11 MPH. The Dragon isn’t all climbing; there’s downhill riding too. It’s fun riding descending through its many curves. It would be a [I]great[/I] place to ride . . . if you could eliminate the a-hole motorcyclists tearing through there at 100 decibels. For whatever reason, it seemed like there were more testosterone-deficient motorbikers zooming through this year. The noise got annoying. I was happy to reach the second rest stop at the North Carolina border (mile 54). Not only did it signal a brief break from climbing, but, more importantly, it meant food. I hadn’t eaten anything since leaving home and had worked up an appetite. Simply put, I pigged out. I must have been at the stop at least 20 minutes. I not only had to relieve my existing hunger, but I knew I needed to stock up energy for the real climbing an one hour hence. I downed sandwiches, fruit, chips, fig newtons, all kinds of goodies. At the North Carolina line, 129 quickly descends (12% at one point) by Cheoah Dam (featured in the movie) The Fugitive. Then it turns and follows the Cheoah River for about 8 miles. Although the Cheoah River span appears fairly level, it’s actually a slight climb. Moreover, the wind wasn’t helpful. And so where I had previously been riding at 18-19 MPH along the lake in Tennessee, I was now traveling in the 15-17 MPH range. The river gorge is very quite. There aren’t many buildings along the road. I understand that at times white water adventurers navigate the river, but I’ve never seen any there. I pulled over for a brief hydration break at rest stop #3. Someone had made a mixing error with the Gatorade cooler there. I had a strong dose of electrolytes. But I drank it anyway, figuring I would need them later. Just past the rest stop the route turns off 129 and heads into an even more remote area. The road is rough and there’s hardly any traffic. I got the feeling that during the week I could sit by that road for more than half an hour and not see any cars. It’s funny how one can pass through an area and not see things. As I rode past a break in the trees I looked back and saw a dam I hadn’t noticed the last two years. After a short but uncomfortably steep climb, the road reaches Santeetlah Lake. It winds for two or three miles in the woods along the lake. It looks like a nice place for canoing. A bit further on, you pass through a quiet campground. Then suddenly you reach the access road which takes you upward to the day’s ultimate test: the Cherohala Skyway. A majority of riders on these type of organized rides are 30-55 year-old males. But you do see all types of cyclists. Younger riders, retirees, tandem bicycle riders, recumbent riders. There was even a unicyclist doing a ride I did in May. As I was chugging up the Skyway I came upon a guy toiling on a single speed. “Yikes,” I muttered aloud. I’m don’t know what that guy’s gear ratio was, but he had an awful small ring in the back. I’m not sure if he made it to the top or not. 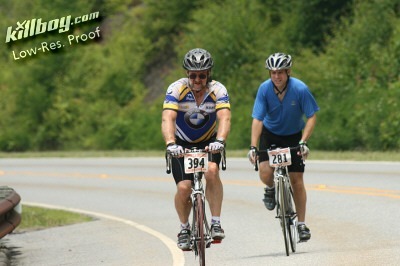 He was working awfully hard, and he still had miles of climbing to go. Five miles up I stopped at rest stop #4. I’m glad it was there. It was located at the end of one of the steeper runs and I was about to have a meltdown, with sweat pouring onto my face and eyes. I dried off with paper towels, refilled my water bottles, and proceeded to refill my stomach. Someone said that a ride like this burns 5,000-6,000 calories. I don’t know if that’s an accurate estimate, but I made a big dent in that requirement at my two food stops. I sucked on that thing for a minute or two–ingesting salt–but soon it started to taste nasty, so I spit it out. Water-based consumption is better. As I hopped on my bike again and started up the mountain, I got worried. My legs suddenly felt sore, and I still felt some discomfort in my knee. That’s not a good feeling with 8 miles remaining to reach the top. Thankfully, my fears of immediate doom were short-lived. My legs started feeling stronger once they warmed up again. Moreover, the higher elevation, swirling winds, and partial cloud cover all helped keep me cooler than I had been during the first leg of the climb. In fact, was I was feeling a little reinvigorated the last two miles before the summit. I encouraged a couple guys I passed as we approached the top. I felt a palpable sense of relief and accomplishment when I reached the Santeelah overlook rest stop, the high point of the Skyway (5,390 feet above sea level). Although I knew the day’s climbing wasn’t over, it was nice that the monster climb was over. I basked in the glow at the stop for several minutes, enjoying what you could see of the horizon on a hazy day. Incidentally, my average speed, which was 19.2 MPH the first 42 miles, dropped to 15.2 MPH at the peak (mile 83). There was nowhere but downhill to go from there . . . for the most part. Roughly 25 of the next 30 miles is downhill, 16 miles of which is a fairly steep descent. It was nice to go into coasting mode, though that’s not necessarily the most comfortable thing to do after you’ve been on the bike for six hours. 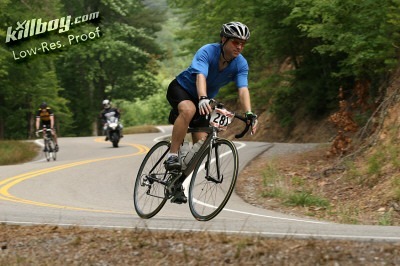 On one of the straighter, steeper runs I got into as aerodynamic a tuck as I could to see how fast I could roll. I reached 43 MPH, which, while slow for many cyclists, is one of my fastest recorded speeds. What can I say . . . I’m not much of a downhiller. As I said, it wasn’t all downhill. 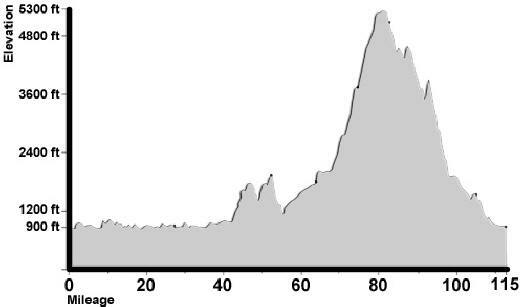 There are two abrupt climbs (called “sawteeth” due to their appearance on the elevation profile), plus a few more rolling hills as you come off the mountain. The former are tough. It’s almost disorienting to be flying downhill at 35 MPH, then, two minutes later, be plodding back up at 8 MPH for another mile. I worried that my legs would cramp, like last year. But it didn’t happen. The only difficulty I had to cope with was general weariness. I was really watching the mileage as I approached the end of the rollers. By now my two primary contact points with the bicycle–my feet and seat–were getting tired. I had had enough climbing. At last I reached what I recognized to be the last hill before Tellico Plains. What a relief. I could now call it quits . . . almost. The road descends through the woods for a couple miles, then reaches the Tellico River. From there, it’s an easy five miles downstream to town. My legs still had enough juice to ride at 19 MPH. I was ready to finish. There’s several commercial establishments along the river once you leave the national forest. A bunch of people were about enjoying a summer afternoon. Suddenly, there was a lot of traffic, which made me nervous. Prior experience made me wary of some of the drivers around there. Plus, it’s always easier to make a careless mistake when you are tired. Finally, I pulled into the high school driveway. One last little climb up a hill (to spite us) and I rolled around the building to the parking lot. I must have turned the wrong way because I missed the photographed finish line. Oh well. Frankly, I was most interested in seeing my car–it never looked so inviting. There were showers available in the school, but I hadn’t brought showering gear. I cleaned up at the sink as well as possible, then went to the cafeteria for the post-ride meal. The finish line food disappointed me. I had worked up an appetite. Yet all they had were medium-sized burgers (limit one), potato chips, and soft drinks. Out in the hallway there was a cart with left-over fruit, but frankly I’d reached my daily tolerance limit for grapes and bananas. My stomach was let down. All in all, though, it was a great day of cycling. 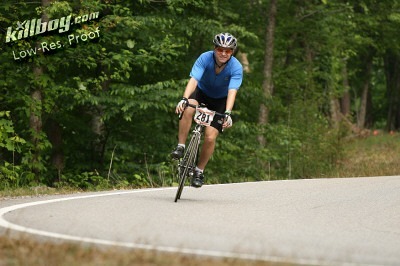 I basked a tired, sunburned afterglow of accomplishment as I drove back to Knoxville. Rest stops: The Challenge has six rest stops, so there’s no need to dehydrate or bonk. The rest stops were well stocked with a decent variety of foods. SAG/Mechanical Support: Fortunately, I’ve never needed any roadside assistance during this event. From time to time a motorcycle or support vehicle passed by. But my sense is that if you had an ill-timed breakdown, you might have to wait a while for help. Support seemed to be better on the Skyway; several vehicles ferried troubled riders up the mountain. Scenery: Fantastic. To me this is one of the primary draws to the event. Quiet countryside, scenic rivers, cool lakes, enchanting forests, and the mountain splendor of the skyway. It was too hazy this year to fully appreciate the latter, but that’s how it often is during the summer. Road conditions: Generally good. 129 is bumpy at Chilhowee Lake. Joyce Kilmer Road has rougher pavement than I care for. The other roads are in good shape. They recently repaved the steep descent by Cheoah dam, so you no longer have to worry about hitting a pothole there. Traffic conditions: Traffic is light on most of the roads. The primary traffic issue is the motorcycles roaring through the Tail of the Dragon. There are quite a few on the Skyway, too, but you’re far less likely to get run over there due to its sweeping curves.